It's official: ASUS is obsessed with hybrids. The Taipei, Taiwan-based PC vendor wasn't satisfied with a device that served as two, so it made one that works as four … technically. This is the Transformer Book Duet, a 13.3-inch Windows 8.1 laptop, Android 4.1 laptop, a Windows tablet and an Android tablet – all in a single detachable hybrid laptop. How does it do it? ASUS took the Transformer Book series's trademark locking keyboard dock design, shoved a Haswell processor (up to Intel Core i7) inside and slapped both Windows and Android on it. 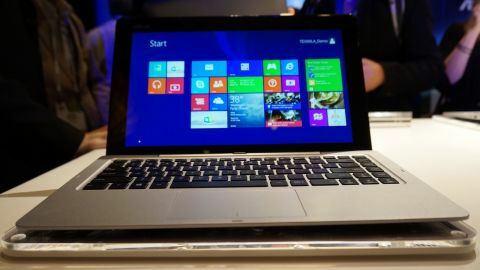 The result is a four-way hybrid laptop that switches between both operating systems in just four seconds. If you remember way back to June of 2013, Samsung beat ASUS to the punch with its own Windows-Android hybrid, the ATIV Q, though it has been delayed indefinitely. The differences here are that a.) the Duet is here now and b.) the Duet is a detachable hybrid. During my time with the tablet … laptop … thingy, switching between Windows and Android was super fast: about 4 seconds using either the dedicated function key or software button. What's better is that switching between operating systems does not close your apps in either OS. ASUS says this is because switching is handled at the hardware level by the 4th generation Intel chip inside the tablet. This means that you could be running Microsoft Word on Windows while running, say, Netflix on Android on the same device without worrying about losing progress in either when switching. That said, I'm not quite sure what benefit this brings, considering most major apps that are available on Android are found on Windows 8 (if not in Modern UI then the desktop). It's certainly an impressive achievement, but that doesn't make it any more useful. Switching between Windows 8's standard desktop interface and Modern UI is jarring enough – now ASUS has arguably introduced a third, completely different interface into the equation. This doesn't seem to be an entry-level device in the slightest. Given it's 13.3-inch form factor, the Duet makes for an unwieldy and hefty tablet. I almost developed a hand cramp trying to take photos of the thing during the CES 2014 demo event. The Duet is not something you're going to want to hold with one hand and the other on the rail of the subway or bus. Altogether, this laptop weighs 4.18 pounds, which isn't quite as feathery as a MacBook Air, though the Duet is by no means a monster when docked. To be honest, I've been so spoiled by super thin and light laptops and tablets that this hybrid laptop feels like it would be pain to handle in either form. Perhaps that 's what you get when you cram an SSD or mechanical hard drive into a 13.3-inch tablet and slap it on a sturdy, locking hinge. The convenience of having two devices in one might be nice, but when the Duet is heavier than most 13-inch ultrabooks and 10-inch tablets put together, I can't help but question. There's no denying that the Transformer Book Duet is an achievement for computing, but for what purpose? That the hybrid laptop costs just $599 (about £365, AU$668) definitely sweetens the deal. Even so, it's tough to look past the questionable utility of such a device. The jack-of-all-trades approach that Windows 8 spawned in the mobile computing business has certainly made things interesting. Now, seemingly for the sake of it, ASUS has compounded upon that with a third interface. The Duet may be able to do many things well, dodging the classic "master of none" retort, but why do I need it to?